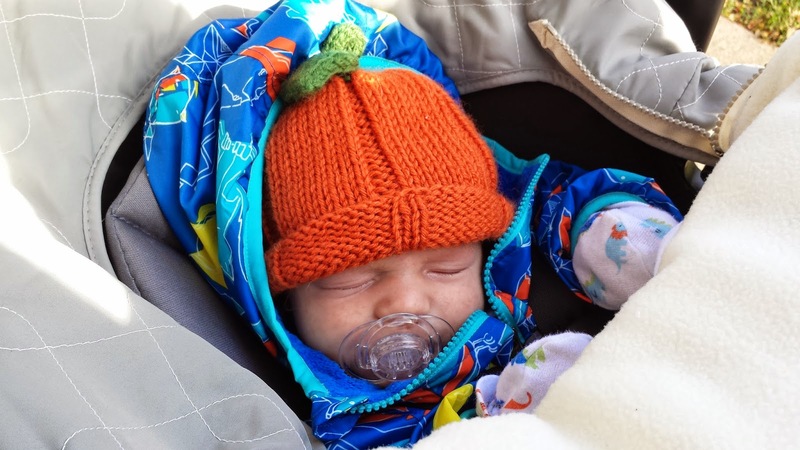 What size is a newborn's head really? 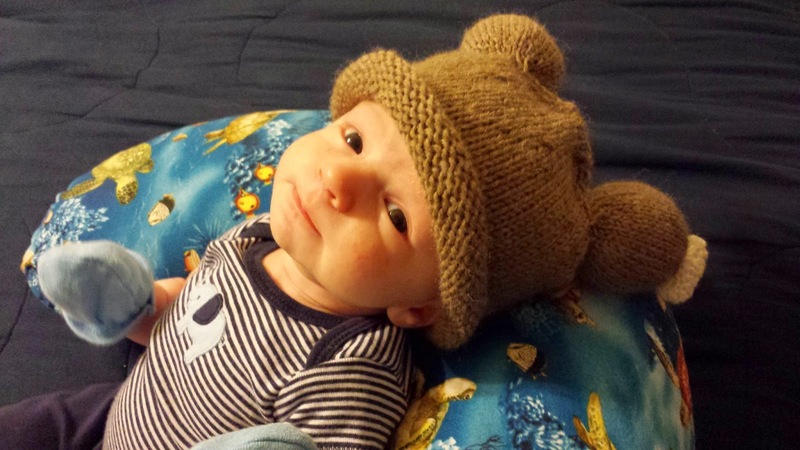 When I was pregnant with Lucky I had no concept of how big his head was and when certain hats would fit him. 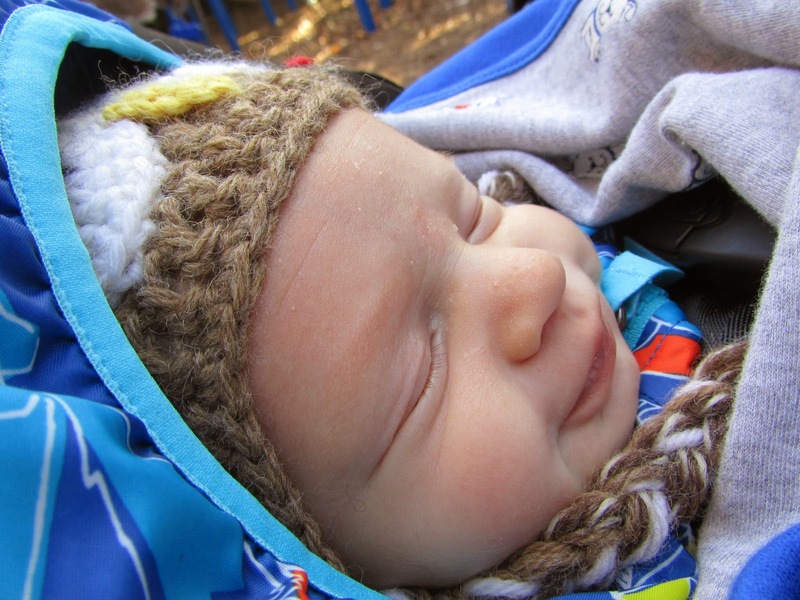 I used a baby hat size chart as a guide, but many patterns still seemed pretty small to me. I became determined to measure Lucky's head every month, both in circumference and in height. For height I chose to measure from eartip to eartip because I could be consistent that way. This height matters to knitters because depending on where you want the hat to lay you want the hat to be at least an inch longer than the eartip to eartip distance. In this post you will find the results of my data collection. I am also providing pictures of Lucky with the measurements of the hats he is wearing as a reference point. Some of these measurements were taken NOW, so they may have been smaller after they were first knit. I hope that this is helpful, I know that I will refer back to this post myself! 5 days old, 7 lbs 3 oz. 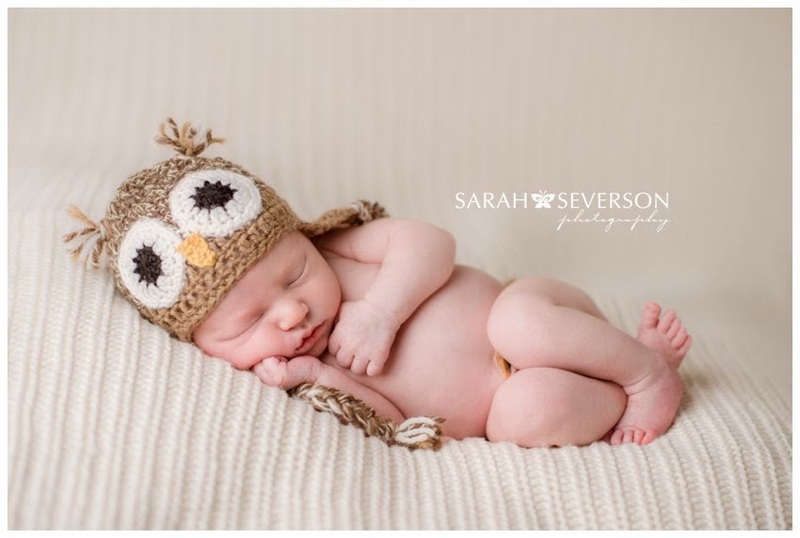 1 week old - Newborn Owl earflap hat . 6" across (flat) and 4.25" from front edge to crown. Photo credit Sarah Severson Photography. 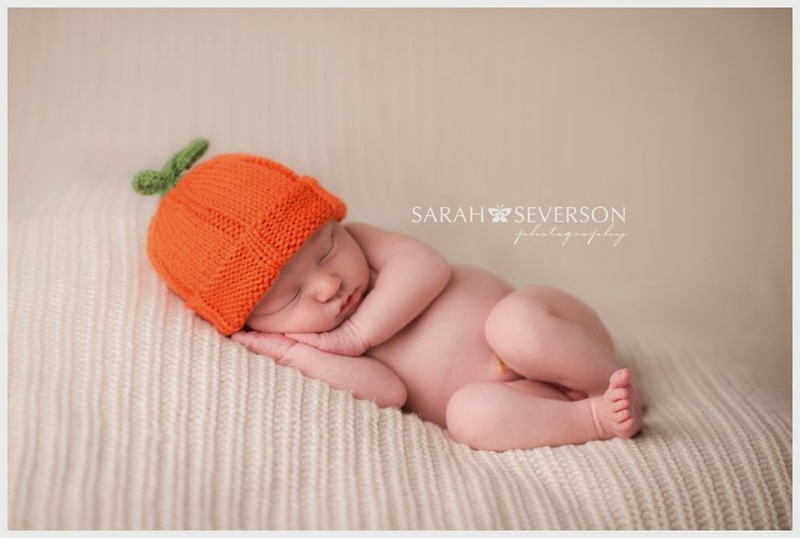 1 week old - Pumpkin Hat. 6" from brim to tip (unfolded), 6.5" across. Photo credit Sarah Severson Photography. 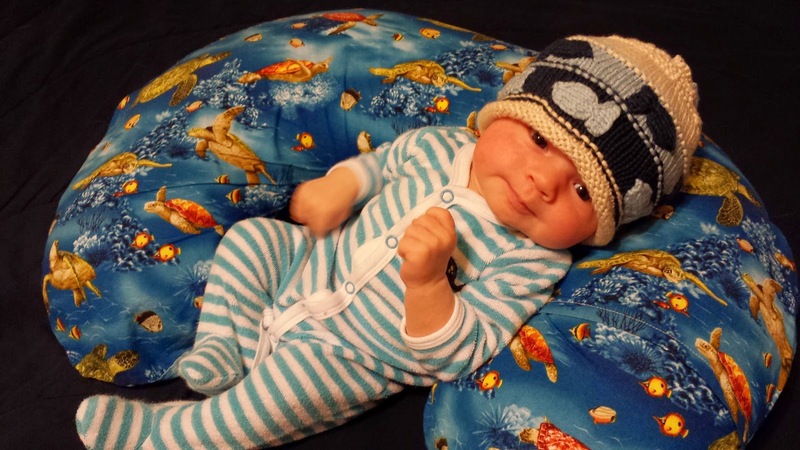 ~2.5 weeks old, Newborn Owl earflap hat.. 6" across (flat) and 4.25" from front edge to crown. 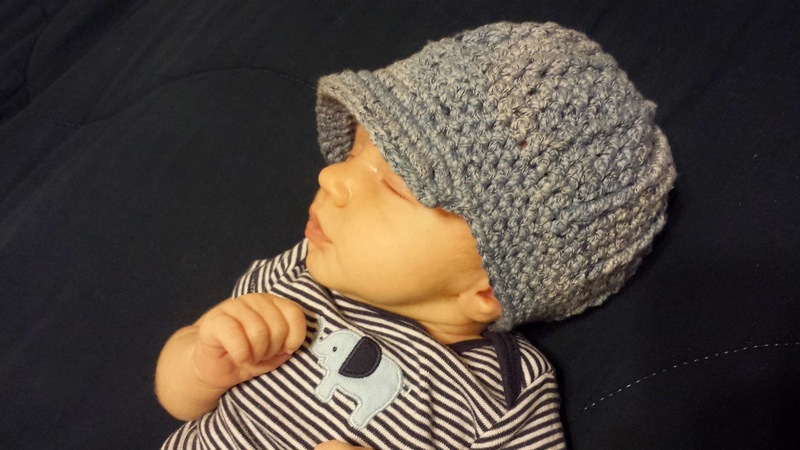 3 weeks old - Ribbed Newsboy Visor Hat. 14" around, 5.5" brim to crown. 1 month old - Turkey Head 7.25" wide, 6.25" brim to crown unrolled. 4.75" rolled. 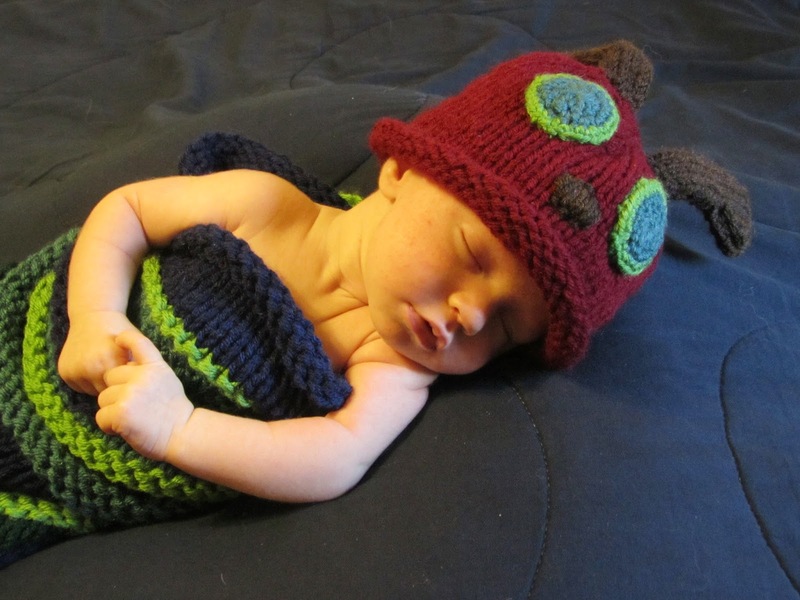 5-6 weeks old - Hungry Caterpillar Hat - 7.5" wide, 5.25" brim to crown rolled, 6" unrolled. 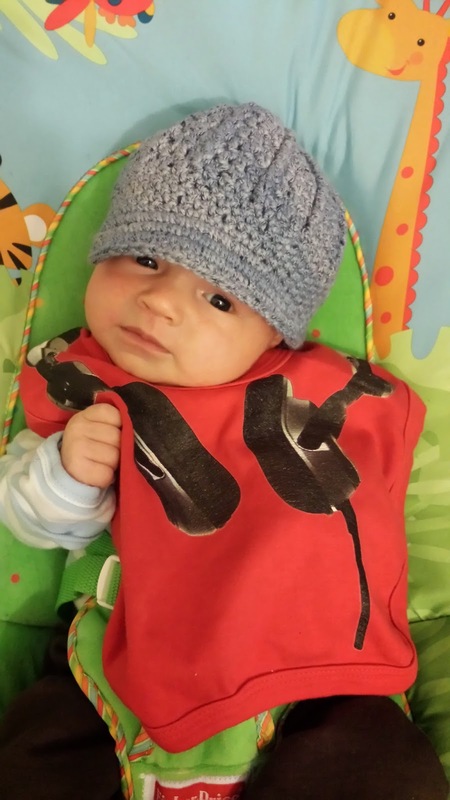 8 weeks old - Ribbed Newsboy Visor Hat. 14" around, 5.5" brim to crown. 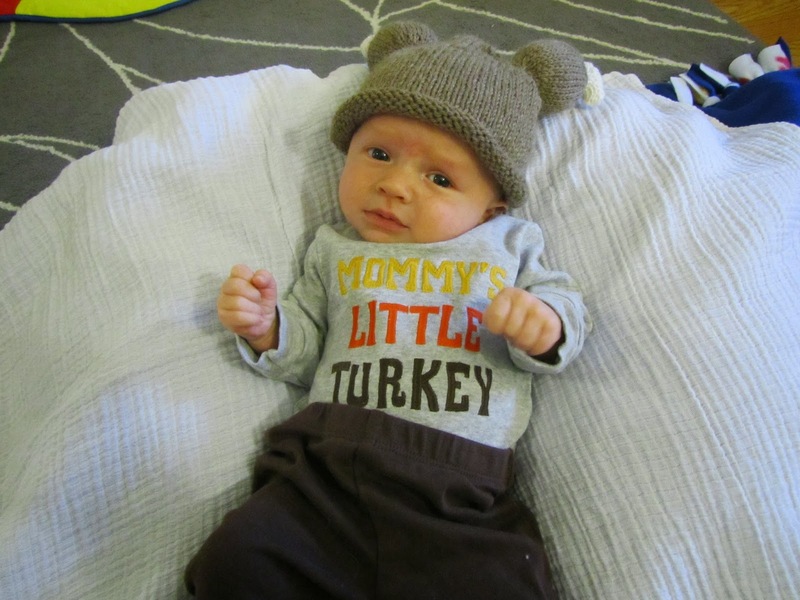 8 weeks old - Thanksgiving 2013 - Turkey Head 7.25" wide, 6.25" brim to crown unrolled. 4.75" rolled. 2 months old - A Lucky Christmas Hat ribbing 5" wide, stockinette 6.5" wide when flat, 9.5" long from brim to the beginning of icords. 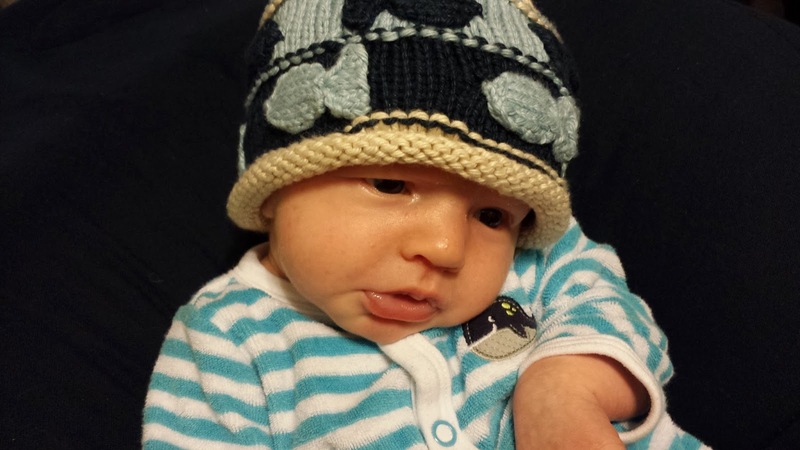 2 months old - Baby Marley Hat - 6.75" wide (flat after lots of wearing), unrolled 7" brim to crown. rolled 6". 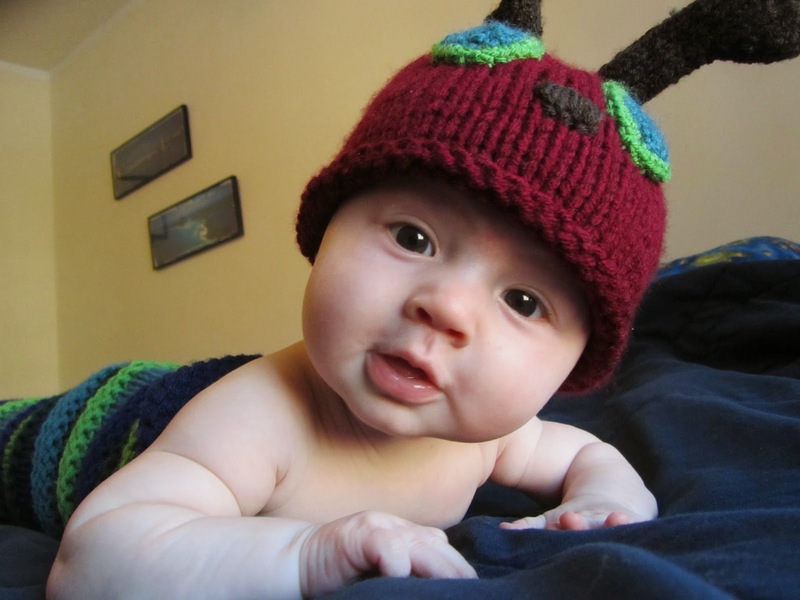 4 months old - Hungry Caterpillar Hat - 7.5" wide, 5.25" brim to crown rolled, 6" unrolled. 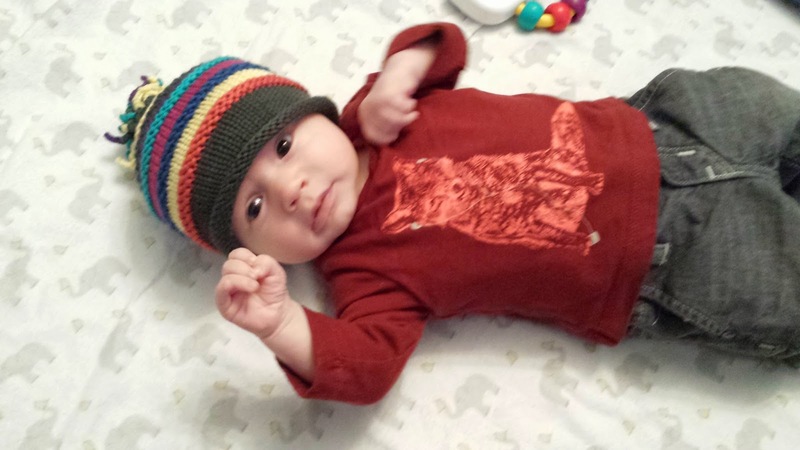 feat measure 3 7/8 "
Lucky wore the Charlie and Baby Marley hats for the rest of the winter. 6 months old (4/9/14). Lucky is 55% for height and head circumference. 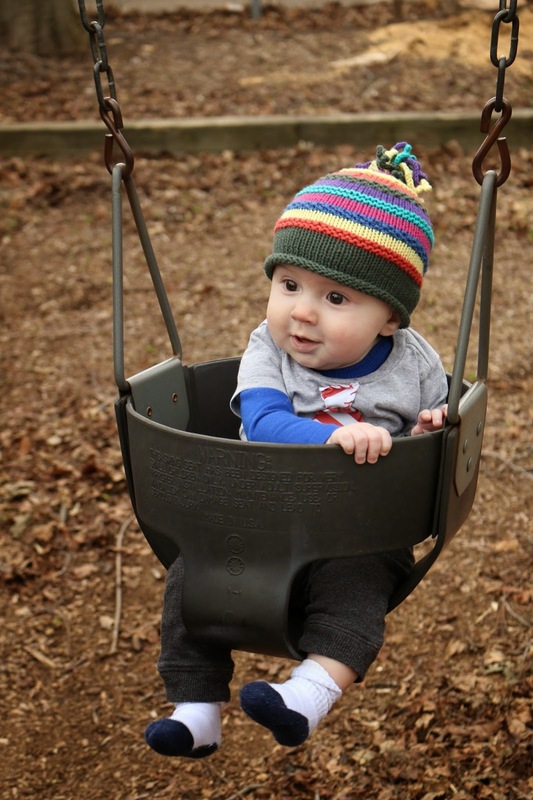 6 months old - Baby Marley Hat - 6.75" wide (flat after lots of wearing), unrolled 7" brim to crown. rolled 6". Head just over 17 3/8"
11 months old. Foxy Hat 8.5" wide (above ribbing), 6.5" brim to crown. 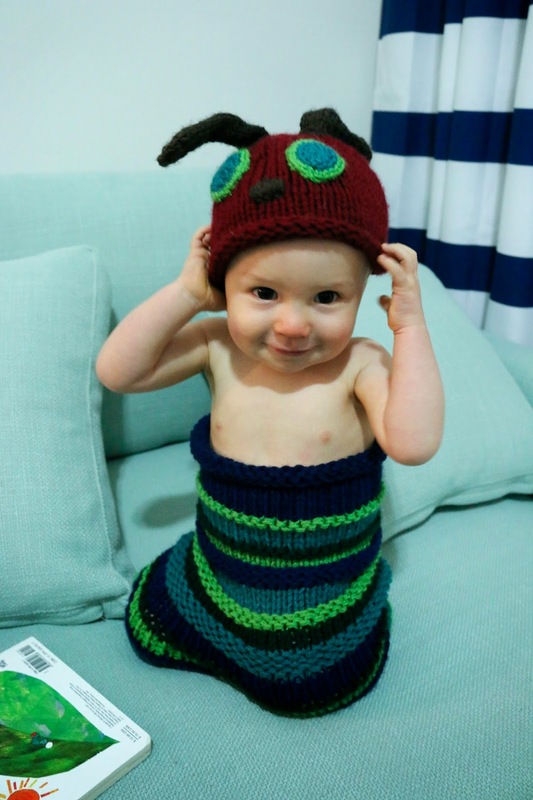 11 months old - Hungry Caterpillar Hat - 7.5" wide, 5.25" brim to crown rolled, 6" unrolled. 1 year old - Snowy Penguin Hat - 16” around, 6.25” deep. Lucy is now 15 months old! He is still wearing the Snowy Penguin Hat and the Foxy Hat. I am not collecting as much data on his head size because as you can see the growth slowed dramatically. 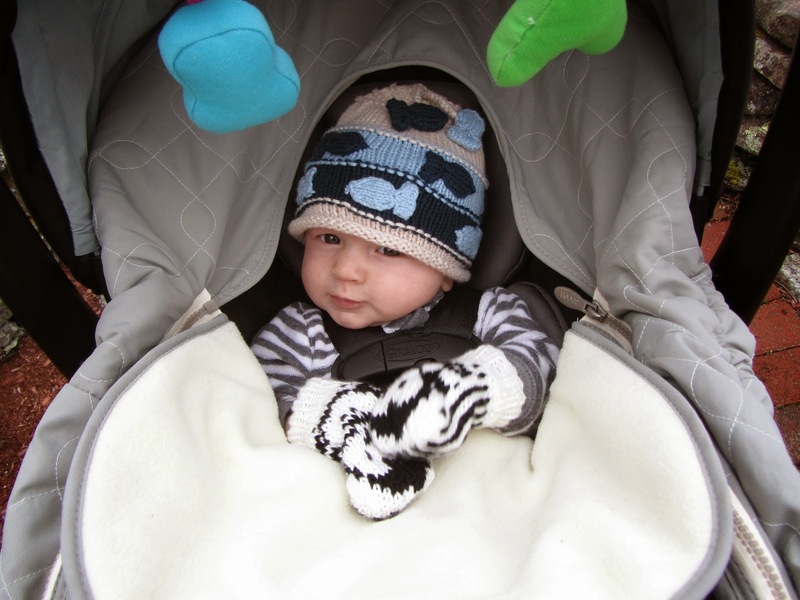 The biggest differences (understandably) happen between birth and the first few months. 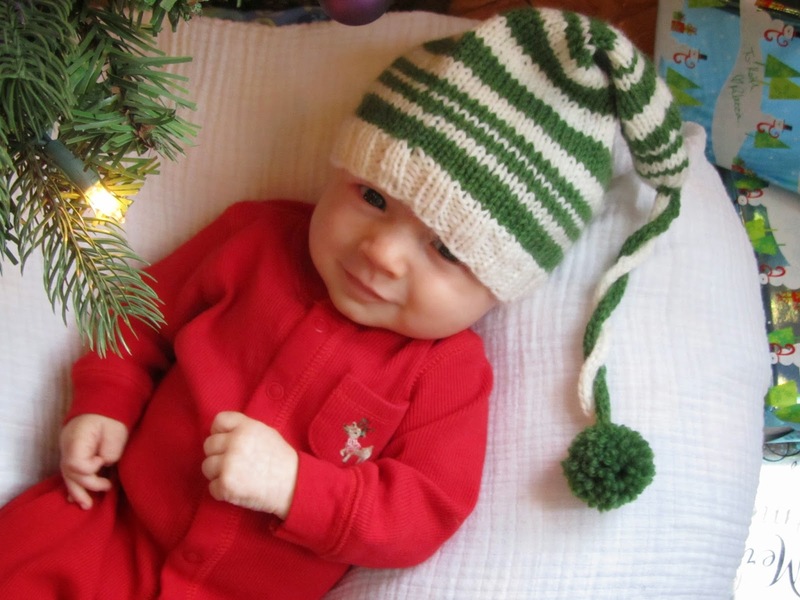 Ribbed hats with a rolled brim are the best gifts because they grow with the baby in terms of width and length. I hope this resource helps you as much as it has helped me already! Happy Knitting!